Waves, tides and currents are three types of natural phenomena that occur on water and whilst they are similar in nature, they are not the same thing. While all three are related to bodies of water, they differ based on their causes, intensity and frequency among other factors . Another common misconception is that while these phenomena are known to drive the sea, the ocean itself is not responsible for the generation of waves, tides and currents. Waves for example are influenced by the action of wind on the surface of the ocean while currents are influenced by the heat from the sun on the equator and cooler poles. Tides on the other hand are caused by gravitational forces from the moon and sun. All three contain some form of moving and potential energy and slight changes can lead to much larger downstream effects that affect nearby communities and recreational users. Waves are defined as the movement of water that occurs on the surface of water bodies like oceans, seas, lakes and rivers. While no two waves are identical, they share common traits like having a measurable height which is defined as the distance from its crest to its trough. They are usually created by winds which transfer energy to the water as they blow over. This results in the production of small water movements known as ripples . These ripples can subsequently grow in size, length and speed to form what we know as waves. These waves are commonly also known as ocean surface waves due to them being generated from the wind passing over the surface of the water . Waves are usually influenced by a range of factors such as wind speed, duration and distance. They are also influenced by the width of the surrounding areas and the depth of the water body itself. As the wind die down, so the height of the wave decreases and while some waves can be small and gentle, if the conditions are right, waves of up to 90 feet can be formed. Powerful waves such as tidal waves or tsunamis can also be formed as a result of earthquakes, landslides or volcanic eruptions. There are many different types of waves such as capillary waves, ripples, seas and swells and they can manifest in a range of shapes and sizes, such as small waves or big swells that can travel over long distances. The size and shape of the wave can also reveal its origin. A small and choppy wave most likely was formed locally by a storm for example while larges waves with high crests suggest origins from far away, possibly in another hemisphere. The size of a wave is usually determined by the distance which the wind blows over the open water, the length of time the wind blows for and the speed of the wind. The greater the above specified parameters, the larger the wave. Tides are formed as a result of centrifugal force and the gravitational attraction between the Earth, Moon and Sun and are often characterised by movements of water over extended periods of time . This rise and fall of water, or rather the difference between the crests and troughs, are defined as tides. The rotation of the Earth together with the gravitational force of the moon results in water being pulled towards the moon. This causes a rise in the water. As the moon rotates around the Earth, the areas experiencing this pull will form what is known as high tides while other areas not feeling this pull will experience a low tide. A similar effect is caused as a result of the sun however this pull is not as strong because the sun is further away from the Earth . Tides mostly occur in deep oceanic regions and are affected by a range of factors such as the alignment of the sun and moon, the pattern of tidal movements and the shape of the coastline. Tides are categorized according to the number of high and low tides formed as well as their relative heights and as such can be classified as being semi-diurnal, diurnal or mixed. High tides are defined as when the crest of the wave reaches the coast while low tides are when the trough of the wave reaches the coast. Semidiurnal tides experience 2 highs and 2 lows of equal size every 24 hours and 50 minutes. Diurnal tides experience one high and one low while a mixed semidiurnal tide experiences 2 highs and 2 lows of different size every 24 hours and 50 minutes. The large masses of water moving in a specific direction from one location to another are known as currents. They occur on open bodies of water like oceans and are usually measured in knots or meters per second. 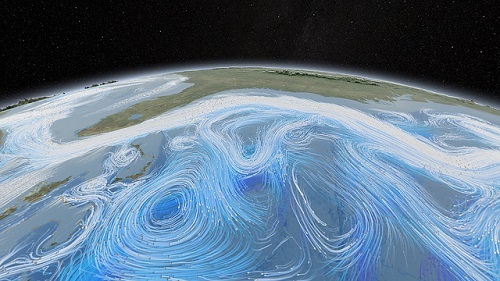 Oceanic currents are directly influenced by three main factors. These are the rise and fall of the tide, wind and thermohaline circulation . The rise and fall of tides are also known to influence oceanic currents by creating currents either near the shore, or in bays and estuaries. These are known as tidal currents and are the only type of current that changes in a regular pattern and whose changes can be predicted . Winds are known to drive currents at or near the oceanic surface and can influence water movements on a localised or global scale. Temperature also plays a major factor when it comes to currents. Water bodies near the poles are cold while water near the equator is warmer and these differences in temperature play an important part in causing currents. Cold water currents occur as the cold water near the poles sink and moves towards the equator while warm water currents move outward from the equator along the surface towards the poles in an attempt to replace the sinking water. This mixing of warm and cold water causes currents and as they move around the globe from hemisphere to hemisphere they also help to replenish oxygen supplies with water bodies . Differences in temperature, density and salinity are often referred to as thermohaline circulation. Differences in water density as a result of temperature (thermo) and salinity (haline) differences will also cause changes in currents. These thermohaline circulation changes occur in different parts of the ocean and can occur at both deep and shallow oceanic levels and can be long lasting or temporary . Additional factors that affect currents include rain runoff and ocean bottom topography. Ocean topography is influenced by slopes, ridges and valleys on the bottom which in turn can affect the direction of currents. These currents are known to affect the Earth’s climate by driving warm waters from the equator and cold waters from the poles around the earth. For example, the warm Gulf Stream is known to bring milder weather to Norway as opposed to New York which is further south . There are a range of different currents such as 1) surface currents which are affected by wind patterns that usually occur at depths of no more than 300 m and 2) world oceanic currents such as the warm Gulf Stream explained above and El Nino currents for example. Tides, waves and currents are completely different. They form under different conditions and are influenced by different factors. Waves are somewhat more noticeable than tides and currents while tides can often be seen on the shore. Understanding the differences between waves, tides and currents is imperative as it not only aids navigation but also helps people predict and measure them. Obtaining this information is useful as it allows individuals to direct cargo ships safely, determine the extent of an oil spill and best fishing spots, allows for tsunami tracking and aids in environmental restoration activities. Waves move from side to side Tides move up and down Currents flow clockwise in the Northern Hemisphere and counter clockwise in the Southern Hemisphere. This is known as the Coriolis Effect. Shalinee Naidoo. "Difference between waves, tides and currents." DifferenceBetween.net. June 22, 2017 < http://www.differencebetween.net/science/difference-between-waves-tides-and-currents/ >. Indeed explicitly mentioned. Excellent site.